Has the hemorrhaging finally stopped? Halfway through stock car racing's 10-race championship playoffs and the big story line really isn't the Matt Kenseth versus Jimmie Johnson duel, and the three men coming here trying desperately to hang close, but rather all those nagging ills that ail this sport and keep the rest of the sports world from focusing on the chase. When will it all be finally behind us, and we can all concentrate of the Sprint Cup title fight? -- A potentially large one, which has yet to be delineated publically, is the apparent furor/discontent/debate inside the sport's officiating department. There seems to be some schism between the NASCAR R&D operation in Concord, N.C., which is now being run by ex-General Motors executive Gene Stefanyshyn, a 30-year Detroit man, and the long-time trackside officiating arm directed by Robin Pemberton and John Darby, under the close scrutiny of NASCAR president Mike Helton, the ultimate trackside boss. When Stefanyshyn arrived in NASCAR back in the spring, he was billed as the man to reshape the sport's inspection operations and rules. However, over the summer many in the touring garage were dismissing him as just in charge of a rulebook rewrite, not a rules-maker. Now, though, it appears he is indeed trying to make things happen. And reportedly not everyone is enjoying this process. While the Waltrip furor continues -- Brian Vickers will be sidelined a while, with new blood clots, and Waltrip himself says he's cutting back to two Cup teams for next season, with the loss of NAPA -- USAToday's Nate Ryan may say it just right: "Though the maelstrom has faded from the scandal, there is a lingering stain that NASCAR might find hard to shake this season." 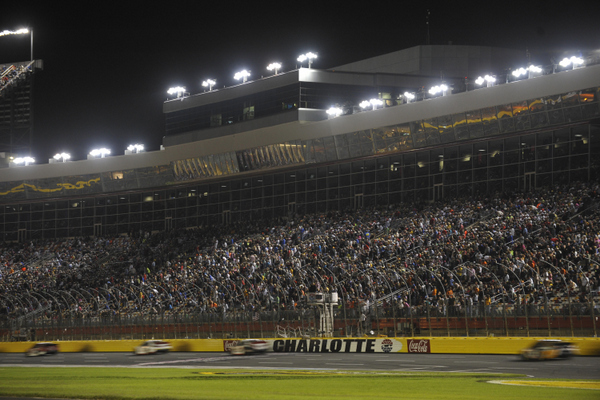 Indeed -- while Brad Keselowski and Kasey Kahne put on a stirring battle in the final miles of last weekend's Charlotte 500, the rest of the race was again a too predictable snoozefest, not really anything to fire up the crowd long-term. 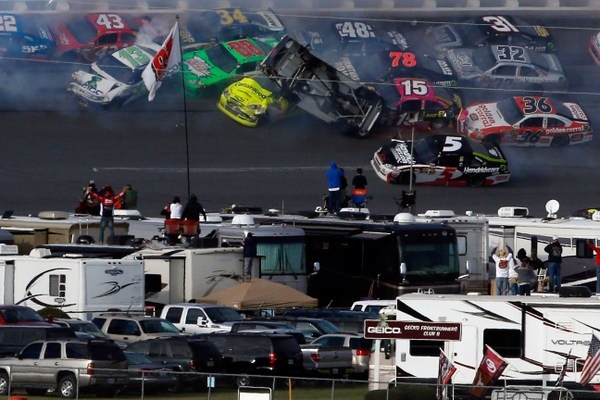 -- How will some drivers approach Sunday's Talladega 500? 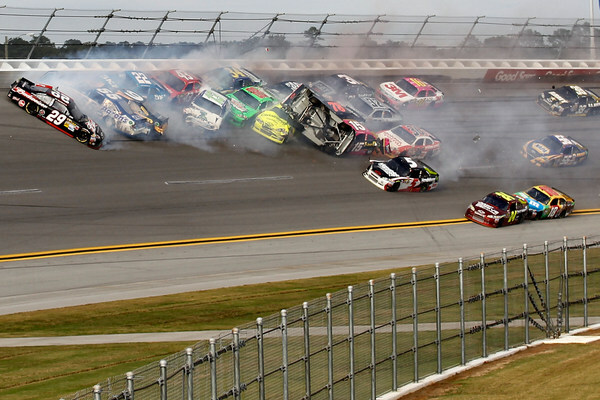 This is a track where huge crashes are so frequent (remember Tony Stewart wiping out virtually the entire field here one year ago, on the last lap?) that some drivers have taken to the strategy of just riding around far behind the peloton, hoping to be able to avoid any of the wrecking. Okay....but is that really 'giving `100 percent,' as NASCAR boss Brian France four weeks ago insisted was one of his top directives? "You've got to go in there with a positive attitude and fight and do your best and try to avoid whatever may occur there or what’s going to occur there and hope that you come out with a race car," said Gordon, who continues to pursue his first victory of the 2013 season. "It doesn't even have to be in one piece; you just need to get it across with a decent finish." Four of the last five years, the tour leader at this point has gone on to win the championship. That's good news for Kenseth, who won here a year ago, and who has averaged a 4.0 finish at this track the past two seasons. "Most people, if they have a legitimate shot in the point standings, go tentative and try to hang in the back, in order to try to minimize possible damage. I think that's good, because I really try to approach Talladega the opposite, as an opportunity." Johnson, on the other hand, comes in here knowing one undisputable fact -- this is his worst track on the tour. Yes, he won the Daytona 500 with typical business-like acumen, and he came back to win the Daytona July 400 too. But Johnson's average finish here over his 12 years is a woeful 17.1. Jeff Gordon, one of three men hoping to catch a break and get back in the heat of the chase, has won more races here than any other title challenger, six. However Gordon has nine DNFs too. However there is still no word on whom NASCAR might sign to sponsor the Nationwide series after that company's sponsorship contract expires at the end of next season. ESPN2's Charlotte Nationwide 300 Friday night earned a 0.8 rating, averaging 1,302,324 viewers; last year's race earned a 1.0 rating, with 1,525,790 viewers. At long last NASCAR has finally made official its 2014 Sprint Cup calendar...with few changes but with a lot of teasers about what may be ahead for 2015, when NBC takes the reins. -- The spring Texas 500 will on Sunday afternoon April 6th. -- Darlington's Southern 500 will be moved to Saturday night April 12th. -- The spring Kansas 400 will be Saturday night May 10th, Mother's Day weekend. 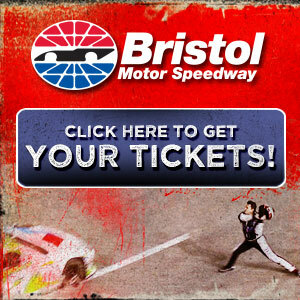 -- The spring Martinsville 500 will be March 30th, a week earlier than this year. NASCAR still hasn't released the 2014 Nationwide and Truck schedules. NASCAR toyed with some big changes to next year's Cup tour, when it looked like NBC would be taking over the second of the season, a year early, from ESPN/Disney/ABC. That stuff has been put on hold. But NASCAR's Steve O'Donnell says the 2015 Cup tour could have some of those changes: " I think we're certainly going to take a look at it. I think the timing with the new TV partners makes sense. "One thing to keep in mind, though, is with each of the tracks, if we constantly are shifting dates, it becomes more and more of a challenge for each track. Our fans like some of the familiarity. We want to balance that. the schedule gets more and more complicated. As NASCAR has grown and becomes one of the real major sports in the world, we've got to take into consideration, as do other sports, what is in the marketplace that you're potentially competing with. Television plays an important role when you look at going up against potentially the Masters or the Final Four." Then, apparently referring to this year's talks with new partner NBC, O'Donnell said TV scheduling is "something that all parties have had to learn a little bit and grow. But I think we're on the right track, and we'll see more of that in 2015." Even Monday night NASCAR, or Midweek NASCAR, O'Donnell says, has been discussed. Without revealing much of the behind-the-scenes discussions with NBC since the July decision, O'Donnell says shaking up the tour calendar "is something that we're taking a bigger look at every year. I think that we're more open than we've ever been to looking at those things. "One of the lessons we've learned: we have to look two, three, four years in advance now, in terms of what is out there from a competing landscape...what are the opportunities. "I think you'll see us do more of that in the future as it becomes more and more competitive in sports." 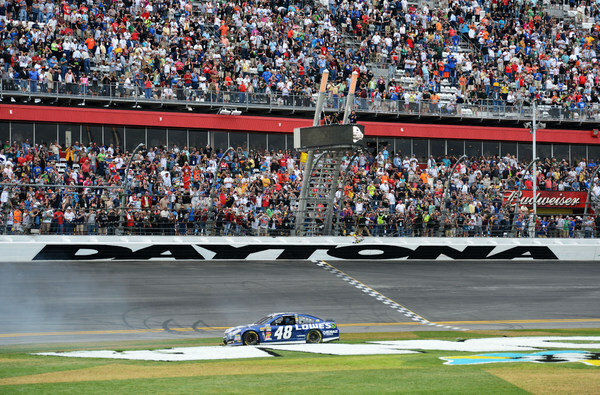 Because TV networks, he says, are making "a really big bet on NASCAR. "We're going to do the right thing and put events in the most successful position we believe they should be in." Submitted by Paul on Fri 10/18/2013 - 18:29. Nascar's obsession with the past is killing its future.nascar needs to understand that dale passed yrs ago and he's not coming back.not everyone wants jr to win or cares what he ate last night.nascar needs to embrace drivers of today . The chase is a failure.it's not exciting and it's far from what the fans consider racing to be.if NASCAR is serious about the sport they need to rethink the race format. The race should be ran in 3 segments.a 400 mile race needs to be 250 / 100 / 50. The winner of the first 200 should receive 5 bonus points. The winner of the 100 lap race 3 points and the last 50 laps raced and points as usual. 15 minutes between segments and exciting racing is back.